Before and during the Vietnam War the Royal Australian Corps of Signals (RASigs) was one of the “Arms Corps” of the Australian Army. The Task Force Signal Squadrons (103 Sig Sqn then 104 Sig Sqn) was part of the 1st Australian Task Force (1ATF) supporting combat operations in Phuoc Tuy Province and beyond. The Australian combat base for 1ATF was located centrally in the Province at Nui Dat. 104 Sig Sqn had sector 4 defence responsibility at the Nui Dat base, which directly protected the 1ATF Headquarters. By Aug 1967, seven four-man Machine Gun (MG) bunkers had been built for the defence of the sector (1). Two were equipped with General Purpose Machine Gun (GPMG) M60 and the remainder with L2A1 automatic rifles (2). The unit was also issued a starlight scope (AN/PVS-2) for its sector defence (3). The scope at the time was a secret piece of equipment. Clearing patrols were mounted at dusk and dawn daily across the sector defence front (Kangaroo Pad). Entrances in and out of the sector wire were protected with trip flares and covered by the machine guns. 547 Sig Tp compound which was part of the 104 Sig Sqn defence area. When deployed with HQ 1ATF (Forward) 104 Sig Sqn’s defence task was to help protect the deployed HQ and as part of the Fire Support Patrol Base (FSPB) defence plan was assigned a sector. This sector normally was in the direct defence of the deployed HQ. Members of the unit would also be involved with patrolling as part of the protection of the FSPB. For example during Jan 1969 members of the unit were deployed to FSPB Julia and 104 Sig Sqn provided two soldiers for patrols in the Julia area on an as required basis. “For a period of approximately three weeks the task force was exposed to some of the heaviest fighting seen by Australians in Vietnam. Coral was partially overrun by the enemy. The Signals Squadron held an important part of the inner perimeter directly protecting the Task Force command post. Throughout these engagements' and a number of subsequent attacks by fire, the members of the Squadron not only held their ground but continued to maintain communications with Australian and supporting United States units and headquarters”. Because of the lessons learned from the Battle, 104 Sig Sqn on future HQ 1ATF deployments always deployed its own Defence and Employment (D&E) Section to assist the unit in the deployment of its communication equipment, protection and defence of its sector under the direction of the unit Squadron Sergeant Major (SSM) while the FSPB was being established. Once the communications and signal sector defence, including individual protection was completed, the unit D&E section would normally return to their normal tasks at Nui Dat. As part of the unit’s communication tasks, the Radio Troop operators were detached to the Battalions, other 1ATF units and setup VHF radio retrains stations as required in support of operations. In addition they provided radio links for our Liaison Officers (LO) attached to US Army (Bearcat, Blackhorse, etc) and ARVN units (Xuyen Moc, Duc Thanh, Long Le, Long Dien, Dat Do, etc) as required. Those members on detachments would assist with the defence of their host units including patrolling. 104 Sig Sqn also did the Task Force special delivery service (SDS) with up to 4 runs a day by the unit dispatch riders (DR) to the Task Force units delivering telegraph messages and other items by vehicle. A similar service called aerial dispatch service (ADS) used aircraft so the DR's could delivering classified messages forward to units away from the Nui Dat base. In addition, the Squadron's Communication Control (Comms Con) members delivered radio codes and keys for encryption devices forward by aircraft, especially once the VHF secure voice equipment started to be used from early 1969. A tactical area of responsibility (TAOR) is a prescribed area in a theatre of combat which has been assigned to a unit commander who is responsible for, and has the authority to act in, the development and maintenance of installations and conduct of tactical operations, area defence, coordination of support and conducting patrols. 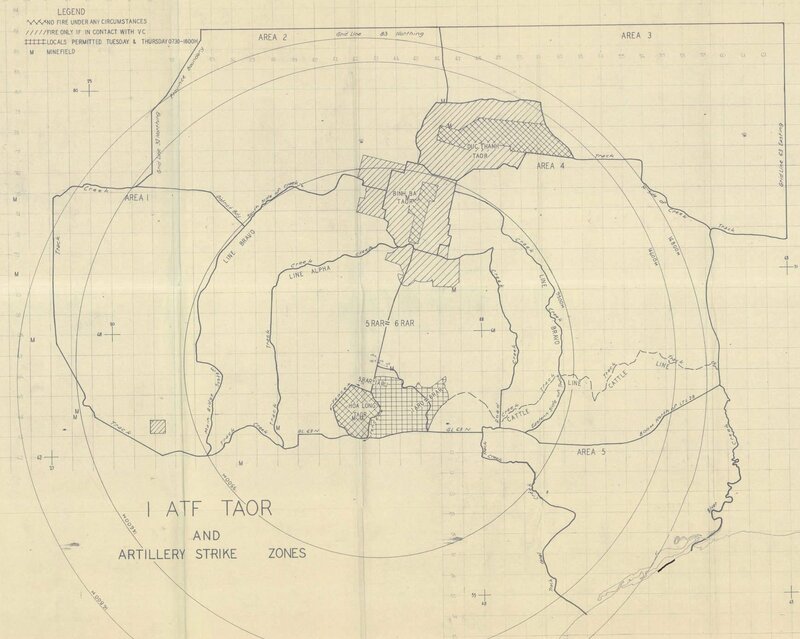 The 1ATF base TAOR defence was based on bunker system on the perimeter combined with aggressive patrolling of the TAOR to protect the Australian base. over the war years but was roughly based on the ALPHA and BRAVO lines. The Battle of Long Tan was a result of TAOR patrolling in Aug 1966 and most likely saved the Nui Dat base from a major enemy force. In 1967/68 a number of unit members did “volunteer patrolling” with Battalions TAOR patrols. Two known TAOR patrol volunteers in 1968 were Sgt Max Lewis and Cpl Denis Hare. One of the TAOR overnight ambush patrols Max did near the village of Hoa Long, had a contact and Max found himself on the wrong side of the paddy field bund. The experienced infantry had quickly moved over the bund before springing the ambush. 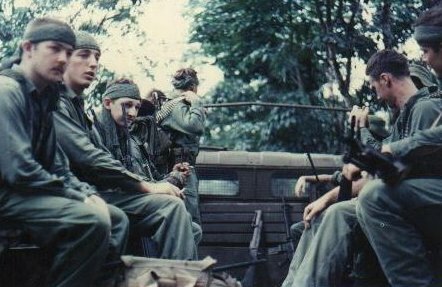 In Nov 1968, to assist with the defence of Nui Dat, 104 Sig Sqn was ordered to assist the 1ATF infantry units (1RAR, 4RAR, 9RAR, 1ARU, D&E Pl (HQ Coy) and the SAS Sqn) with TAOR patrolling (4). Other Arms Corps Units (12 Fd Regt (RAA), 1 Armd Regt (RAAC), 1 Fd Sqn (RAE), 17 Const Sqn (RAE) and 161 Recce Flt (AAAC)) were also tasked, at the same time, to start TAOR patrolling. The patrolling was part of the 1ATF normal program with an infantry battalion delegated to command, control and assist the other Arms Corps units in the patrolling task. 4RAR was 104 Sig Sqn's first battalion for the TAOR patrols, with the 4RAR instructing the Sigs in patrolling tactics and the procedures before the start of 104 Sig Sqn recce, fighting and ambush patrols. This was done in Dec 68 with an NCO and two OR’s taking part in three patrols (4320/68, 4324/68 and 4332/68) conducted by 4RAR. It should be noted that the SAS Sqn also did base TAOR patrols under the same arrangements as 104 Sig Sqn. i.e. Controlled by an Infantry Battalion until late 1970. The first all-member 104 Sig Sqn TAOR patrol was mounted on the 27th Dec 1968 (5) under the command of Sgt Ken Ellis. 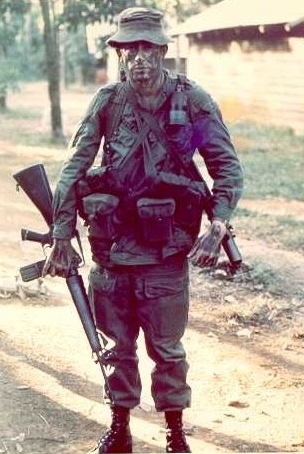 Ken had before arriving in South Vietnam had been involved in patrolling in Thailand as part of Snowgum Force on Exercise Ramasoon in 1968 at U- Tapao Air Base and therefore was selected to lead because of this operational experience. He took part in one of the patrols with 4RAR early in Dec 1968 that was used to train 104 Sig Sqn members in the Battalion procedures and patrol know-how. Photo: Patrol Commander, Sgt Ken Ellis on the first all 104 Sig Sqn TAOR Patrol (27/28 Dec 1968). This started the role of TAOR patrolling for 104 Sig Sqn which continued until the end of the war. During the war 104 Sig Sqn was part of the TAOR program for 4RAR then 2RAR/NZ then 6RAR/NZ and finally back with 4RAR/NZ on the battalion’s second tour. However 104 Sig Sqn was also given other patrolling and protection tasks including Guard Duties at the Canberra BEQ, Saigon and protection patrols for overnight Integrated Civil Affairs Programme (ICAP) run by the 1st Australian Civil Affairs Unit (1ACAU). Patrols located in war diaries and other records involving 104 Sig Sqn, are detailed in the tables below. For 104 Sig Sqn we have located 55 x Overnight 1ATF TAOR Patrols under the control of an infantry battalion, 3 x Overnight Training Patrols with 4RAR, 2 x Guard Duties (seven men for a week) in Saigon plus 6 x Overnight Protection Parties for 1ACAU while working with the Vietnamese. Members of the unit going forward to FSPBs in a D & E role to help setup the signals defence sector plus flying up 16 x dummy SAS missions with 9 Sqn RAAF to mask 2SAS Sqn's withdrawal for returning to Australia. All are detailed with references in the tables below. The Task Force Signal Squadrons of the Vietnam War were not only communicators but combat troops as per the RASigs role. 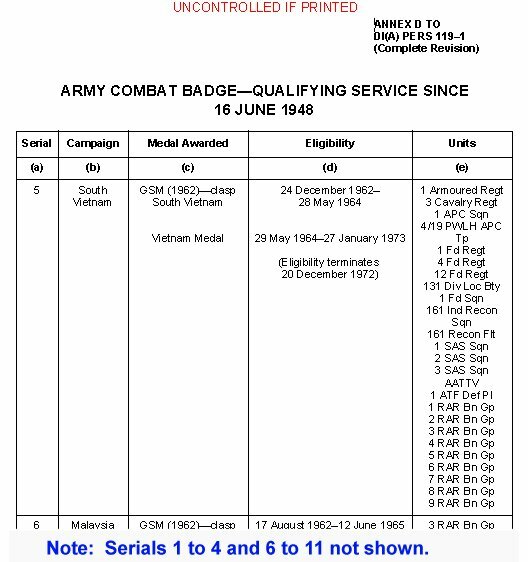 However they were the only Arms Corps soldiers as part of the 1ATF Order of Battle (ORBAT)(7) who weren’t granted retrospective approval for the Army Combat Badge (ACB) after 90 days service when it was introduced in 2005. Why was 103 Sig Sqn and 104 Sig Sqn not included as eligible units in the ACB “Qualifying service since 16 June 1948, Table, Serial 5” of ANNEX D to DI(A) PERS 119-1 (Complete Revision) – PERS 8/2006 5 Oct 2006" when both units clearly and demonstrably met the qualifying criteria? Why? WO2 S Conlon (SSM) June? 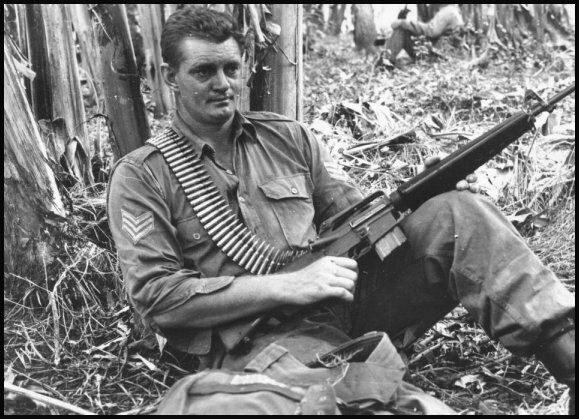 Photo (Left): Sgt Scott Laycock with M16 on first TAOR Patrol 27-28 Dec 1968. Photo (Right): Sig Allen Summerfield with AN/PRC-25 on first TAOR Patrol 27-28 Dec 1968. Note: 1ATF Integrated Civic Action Programme (ICAP) was an operation carried out in contested hamlets, normally at night by the 1 Australian Civil Affairs Unit. Units provided security force to protect the ICAP team. 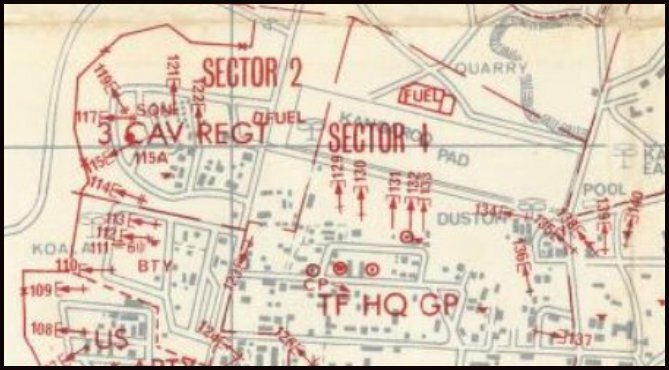 Note: From 104 Sig Sqn Oct 70 War Diary details 1ATF TAOR patrolling going to 4 man reconnaissance because of reorganization of operations into two battalions. Unit preparing training for new requirement. This didn't happen. L-R (Right side of truck) ?, ?, Derek Kerr and Peter Scheinpflug. Note: No contact but sound of voices it is thought that a small group moved within 100-200m of the ambush position. No follow-up action was possible due to darkness. Note: 20/71 - No contact was made with the enemy but a number of civilians were sighted outside civil assess areas. Flying 16 dummy SAS missions with 9 Sqn RAAF to mask 2SAS had RTA. Remark: HQ 1ATF moved to Vung Tau early Oct 71 along with most of 104 Sig Sqn. 104 Sig Sqn ACV SIGCEN remained with 4RAR/NZ at Nui Dat and Radio Op with LO detachments remain deployed until early Nov 71. 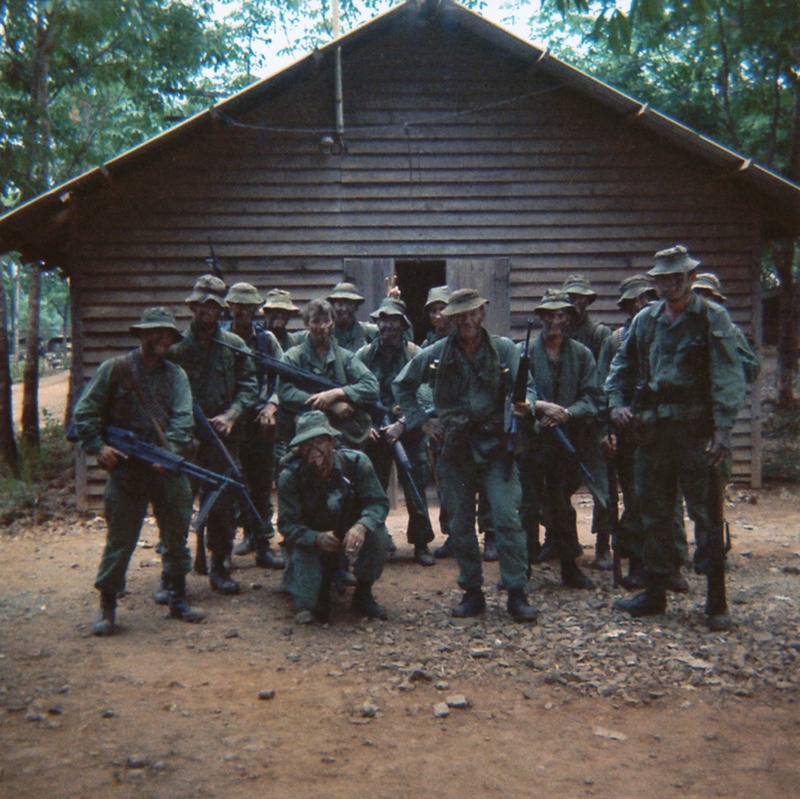 Photo (Left): 25-27 Feb 1971 25/71 TAOR Patrol before leaving 104 Sig Sqn at Nui Dat. Sgt Mick (Bluey) Joseph Patrol Comd, Sgt Ken Mackenzie, Patrol 2IC. Photo (Right): Sgt Ken Mackenzie about to move out on M6/1970 TAOR patrol (7-8 Dec 1970). grenade clipped to his webbing on left side. 1. Bunkers of Sector Defence - AWM95-6-2-5 - 104 Sig Sqn War Diary Aug 67 page 15 – (OC Monthly Report). 2. Two M60 GPMGs – AWM95-1-4-50 1ATF War Diary Jul 67 pages 177/178 and 192 (Weapon Holdings Report). 3. Two M60 GPMGs and Starlight Scope – AWM95-6-2-3 104 Sig Sqn War Diary Jun 67 page 19 (OC Monthly Report). 4. TAOR patrolling for 104 Sig Sqn – AWM95-6-2-20 104 Sig Sqn War Diary Nov 68 page 8 (OC Monthly Report). 5. 104 Sig Sqn patrolling with 4RAR – AWM95-6-2-22 104 Sig Sqn War Diary Jan 69 page 9 (OC Monthly Report). US Forces from 1 Feb 71 – AWM95-1-4-208 1ATF War Diary page 73 to 78 (Report). 7. Order of Battle – AWM95-1-4-45 1ATF War Diary page 41 and 42 (Report).